Bass fishing is one of the most popular recreational types of fishing in the United States, and it also became popular in other countries such as South Africa and Japan. Two major fishing competitions in the U.S., the Bassmaster Tournament Trail, organized by the Bass Anglers Sportsmen Society (B.A.S.S. ), and the Wal-Mart FLW Tour, both target Black bass. The top prize for the former is $500,000 (2006) and $1 Million (2007) for the latter. Due to its popularity, modern bass fishing has evolved into a multi-billion dollar industry. Black bass anglers, including those that participate in these tournaments, generally practice "catch and release" angling; the fish are returned to the water after being hooked and retrieved. 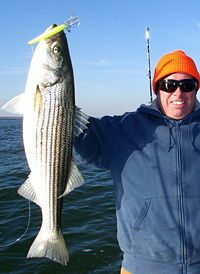 Striped bass fishing is also a popular game sport in the Eastern regions of the United States. Although striped bass fishing is also called "bass fishing" by local anglers, it is distinguished from black bass fishing, widely known simply as bass fishing. Bass fishing (black bass fishing) targets subspecies of the genus Micropterus such as largemouth bass and small mouth bass in freshwater. Striped bass belongs to a different species and striped bass fishing is a different type of fishing from bass fishing. The history of black bass and striped bass fishing raises various environmental issues. The introduction of the Black bass into other regions of the world, such as Japan, has endangered local fish species. The IUCN (International Union for Conservation of Nature and Natural Resources) lists Black bass as one of the Global Invasive species. The history of striped bass is also closely tied to the effect of industrial development on the environment; the construction of dams and water pollution have destroyed natural habitats and the spawning grounds of these game fish as well as other bait fish. There are numerous black bass species considered as gamefish in North America, including largemouth bass (Micropterus salmoides), smallmouth bass (Micropterus dolomieui), spotted bass or Kentucky bass (Micropterus punctatus), Guadalupe bass (Micropterus treculii), and many other species and subspecies of the genus Micropterus. Though referred to as bass, all are actually members of the sunfish family (Centrarchidae). Black bass should not be confused with a multitude of unrelated fish species found around the world and called "bass," such as the butterfly peacock bass (Cichla ocellaris), speckled peacock bass (Cichla temensis), Papuan black bass (Lutjanus goldiei) (also called Niugini bass), Australian bass, rock bass (Ambloplites rupestris), American striped bass, and British sea bass (Dicentrarchus labrax). All black bass are well-known as strong fighters, and are fished recreationally. Depending upon species and various other factors such as water quality and availability of food, black bass may be found in lakes, reservoirs, ponds, rivers, streams, creeks, even roadside ditches. Largemouth are known for their overall size and resistance when hooked, favoring short, powerful runs and escape to cover such as submerged logs or weedbeds. Smallmouth bass tend to jump more and fight aggressively on the surface when hooked, in order to throw the hook. Bass are usually filleted when taken for the table, and the flesh is white and firm, with a delicate taste when cooked. However, more bass anglers are adopting "catch and release" angling and return the fish to the water after being hooked and retrieved. Fly Fishing For Black Bass on the St Lawrence (Louis Rhead) from The Basses-Freshwater and Marine, William C. Harris (1905). Bass fishing in the United States largely evolved on its own, and was not influenced by angling developments in Europe or other parts of the world. Indeed modern British sea bass fisherman look to the United States freshwater bass techniques for inspiration for lure fishing and to the U.S., Japan, and China for tackle. During the early to mid-1800s, wealthy sport anglers in the United States (mostly located in the northeastern portion of the country) largely confined themselves to trout and salmon fishing using fly rods. While smallmouth bass were sought by some fly fishermen, most bass fishing was done by sustenance anglers using poles and live bait. The working-class heritage of bass fishing strongly influenced the sport and is manifested even today in its terminology, hobbyist literature, and media coverage. Sometime during the mid-1800s, the first artificial lure used for bass was developed in the form of an artificial fly. At first, these artificial fly patterns were largely derivations of existing trout and salmon flies. As time went on, new fly patterns were specifically developed to fish for bass, as well as heavier spinner/fly lures that could be cast by the baitcasting and fixed-spool casting reels and rods available at the time. Floating wooden lures (plugs) or poppers of lightweight cork or balsa were introduced around 1900, sometimes combined with hooks dressed with artificial fur or feathers. In the United States, the sport of bass fishing was greatly advanced by the stocking of largemouth and smallmouth bass outside their native ranges in the latter portion of the nineteenth century. As the nation's railroad system expanded, large numbers of "tank" ponds were built by damming various small creeks that intersected the tracks in order to provide water for steam engines; later, new towns often sprang up alongside these water stops. Shippers found that black bass were a hardy species that could be transported in buckets or barrels via the railroad, sometimes using the spigot from the railroad water tank to aerate the fingerlings. Largemouth bass were often stocked in tank ponds and warmer lakes, while smallmouth bass were distributed to lakes and rivers throughout the northern and western United States, as far west as California. Smallmouth were transplanted east of the Appalachians just before the Civil War, and afterward introduced into New England. 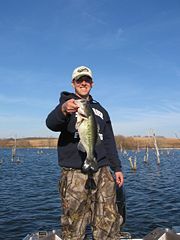 Largemouth bass populations boomed after the U.S. Department of Agriculture began to advise and assist farmers in constructing and stocking farm ponds with largemouth bass, even offering advice on managing various fish species. Soon, those who had stocked largemouth bass on their farm ponds began to pursue them on a burgeoning number of new reservoirs and impoundments built in the United States during the 1940s and 1950s. These impoundments coincided with a postwar fishing boom, supplying additional funds from sales of fishing licenses for the first large-scale attempts at bass fisheries management. This was especially true in the southern United States, where the largemouth bass thrived in waters too warm or turbid for other types of gamefish. With increased industrialization and development, many of the nation's eastern trout rivers were dammed, polluted, or allowed to silt up, raising water temperatures and killing off the native brook trout. 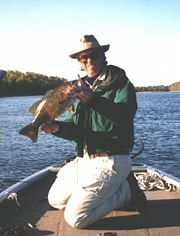 Smallmouth bass were often introduced to northern rivers now too warm for native trout, and slowly became a popular gamefish with many anglers. Equally adaptable to large, cool-water impoundments and reservoirs, the smallmouth also spread far beyond its original native range. Later, smallmouth populations also began to decline after years of damage caused by overdevelopment and industrial and agricultural pollution, as well as a loss of river habitat caused by damming many formerly wild rivers in order to form lakes or reservoirs. In recent years, a renewed emphasis on preserving water quality and riparian habitat in the nation's rivers and lakes, together with stricter management practices, eventually benefited smallmouth populations and has caused a resurgence in their popularity with anglers. Example of a very young specimen of M. salmoides (Largemouth Bass) caught by an angler in Minnesota. By the early 1900s, bass fishing had been well established as a sport with its own following. Though the use of artificial lures for bass had begun with the artificial fly and fly fishing tackle, the bait casting rod and reel soon came to dominate the sport. Although fixed-spool reels were introduced in use in the United States as early as the 1870s, spinning reels and rods did not gain wide acceptance as an angling tool until the 1950s. Since that time, most bass anglers have used bait casting or spinning tackle, using either artificial lures or live bait (See Fishing rod, Fishing reel). During the 1950s and 1960s, the development of specific angling tools for bass significantly increased angler success and helped stimulate the development of the sport. Some of these innovations include the invention of monofilament nylon fishing lines, the fiberglass (later graphite composite) fishing rod, the electric trolling motor, the fish finder/depth locator, and new artificial lures and baits made of various plastics. Recently, advanced electronics that mimic the sounds of schooling bait fish have been introduced, and a controversy has arisen over the proper use of these devices in bass tournament fishing. Since the early 1990s, fly fishing for bass, particularly smallmouth bass, has again become popular, using fly patterns, rods, and fly lines suited for bass. Fishermen, conservation groups, and governmental wildlife departments have introduced black bass of various species across the world for the sport of fishing. Outside North America, Japan and South Africa have active programs. Bass fishing as a sport was helped along by the chase for the standing world record which has held for over 75 years. Though surrounded by controversy it is widely accepted that, in 1932, a 22 pound 4 ounce bass was caught by George Perry in Montgomery Lake, Georgia. It is one of the longest standing records in the sport of fishing. The increasingly popularity of the sport combined with "catch and release" practices have in some cases led to an overpopulation of bass. (a) The largemouth bass caught are all less than 1 pound and are "skinny." (b) The bluegills are 1/2 pound and larger (too large for the bass to eat). (a) Not enough bass being harvested. bass population does not have an adequate food supply. Against letting nature sort it out (which it will) it is posited that the easiest way to control an overpopulation of largemouth bass is by increasing the take of bass. This is clearly an effective method of thinning the bass population providing recreation at the same time—which is more important to American Bass anglers. It may take two to three years to bring the population back into balance. If forage fish are scarce, stock adult bluegill or redear sunfish (7 to 8 inches long). These fish will be too large to be eaten by the bass. The large panfish will spawn in the spring and produce a supply of forage. There are two major bass fishing competitions in the United States. One is the Bassmaster Tournament Trail, organized by the Bass Anglers Sportsmen Society (B.A.S.S.). It was started by Ray Scott, the "father" of competitive bass fishing. First held in 1969, today, professionals like Michael Iaconelli, Kevin VanDam, Robert Baney, Edward Paffendorf IV, Aaron Martens, Rick Clunn, and Luke Clausen are household names to many American sports fans. There are 12 events in which the top 50 anglers compete. The top prize in the Bassmasters Classic is $500,000 in 2006. The other is the Wal-Mart FLW Tour. The top prize of the Forrest Wood Cup is $1 Million in 2007. Both tours are nationally televised on networks like ESPN and Fox Sports Net (ESPN actually owns and operates B.A.S.S. ), and covered extensively by news media. In modern bass fishing competitions, caught bass are placed in a live well, and released as soon as caught and weighed by officials. Competitors are penalized heavily for dead fish and in some cases dead fish are not weighed. Fish turned in for weighing are immediately released or placed in tanks and treated for stress and glyco-protein (slime coat) injury, then released back into the water. Competitive bass fishing has also spread to anglers in other countries such as Japan, Australia, and South Africa. Black bass' primary natural habitats are Eastern United States. Due to popularity of bass fishing and ease of fish farming, Black bass was imported to regions where the species did not exist. The Black bass, however, often quickly dominated the streams, lakes, and rivers because of its strong reproductive capacities and lack of natural predators in the new environment. Some native species have been endangered. In Japan, for example, Tetsuma Akaboshi imported about ninety Black bass and released them to Ashinoko Lake in 1925. The government approved the release for a recreational fishing and for food resource purposes. The Black bass was released to additional five lakes in 1903s as an experiment. By 1970s, damages to existing species became evident and governments began to give limited restrictions for the release. In spite of various efforts including those by the Ministry of Environment of Japan, the bass has been spread to all over Japan by 2000. IUCN (International Union for Conservation of Nature and Natural Resources) lists Black bass as one of the Global Invasive species. Japanese governments are trying to restore ecological balance while keeping them for a popular game fishing. Some countries such as England and Korean ban the import of live Back bass to prevent the damages. Striped bass are perciform fish found all along the Atlantic coast, from Florida to Nova Scotia, and are caught as far north as Hudson Bay. They are of significant value as sporting fish, and have been introduced to many areas outside their native range. Although local angers often call striped bass fishing as bass fishing, bass fishing usually designate Black bass fishing targeting such species as largemouth bass and small mouth bass. Striped bass anadromous (Morone saxatilis, also called rock or rockfish) are typical members of the Moronidae family in shape, having a streamlined, silvery body marked with longitudinal dark stripes running from behind the gills to the base of the tail. It inhabits rivers, bays, inlets, estuaries, and creeks. It is quite abundant in the Chesapeake Bay and its tributaries. There, it frequently grows over four feet in length and weighs over 22 kg (50 lb). A variety of angling methods are used, including trolling and surfcasting. The largest striped bass ever caught by angling was a 35.6 kg (78.5 lb) specimen taken in Atlantic City, NJ on September 21, 1982. The striped bass will swim up rivers a hundred miles or more, and in Maine they are quite plentiful in the Penobscot River and Kennebec River. Further south in Connecticut some very large ones are taken both offshore and in the Connecticut River, and the waters surrounding New York City have proven a fertile fishing ground with good sized specimens being caught during spring and summer months. East Coast striped bass in the U.S. are typically found from the Carolinas to Nova Scotia. The Chesapeake Bay is the major producer area for striped bass, with the Hudson river being a secondary producer. Spawning migration begins in March when the migratory component of the stock returns to their natal rivers to spawn. It is believed that females migrate after age five. These fish are believed to remain in the ocean during the spawning run. Males as young as two years old have been encountered in the spawning areas of the Chesapeake Bay. The migratory range of the northern (hudson stock) extends from the Carolinas to New York's Hudson River in the winter time and from New Jersey through Maine in summertime with the greatest concentration between Long Island, New York, Rhode Island, and Massachusetts. The migration of the northern stock to the south often begins in September from areas in Maine. On the West Coast, stripers are found throughout the San Francisco Bay and surrounding coastline. They are also found in the California Aqueduct canal system, and many California lakes such as Lake Castaic, Lake Skinner, Diamond Valley Reservoir, Silverwood Lake, Pyramid Lake, San Antonio Lake, and others. The striped bass have also developed into a prominent predator in many Colorado River lakes: Lake Havasu, Lake Mead, and Lake Mohave. Therefore, as land locked striped bass, are located in Nevada and Arizona. The Lake Mohave record striped bass weighed in at 60 lbs 14 oz. Furthermore, striped bass are now located all across the nation. Frequent "boils" or swarms, often consisting of twenty or more striped bass, may be observed in these lakes, representing an excellent fishing opportunity, especially with Pencil Poppers or other similar trout-looking surface lures where trout and other similar sized fish are often stocked. In winter they keep to their haunts, and do not go into deep water like other fish of similar habits. In the spring of the year the striped bass runs up the rivers and into other fresh water places to spawn—and then again late in the fall to shelter. The fall run is the best. They can be caught however nearly all the year round, and of all sizes. Striped bass can be caught using a number of baits including: clams, eels, anchovies, bloodworms, nightcrawlers, chicken livers, menhaden, herring, shad, and sandworms. At times, striped bass can be very choosy about the baits they take. Because of the wide variety of baits that are known to work and their finicky nature, they are considered among fishermen as being an opportunistic or "lazy" feeder. However, it is estimated that 90 percent of their diet is fish. Fishing from the shore is a popular method of striped bass fishing among anglers who may not have access to a boat or simply prefer to stay on shore. Shore fishing can include fishing the shores of inland waterways, saltwater ponds, rivers, and bays. Various methods of light tackle to heavy gear can be used. More challenging shore fishing along the immediate ocean coastline is often referred to as surfcasting. Surfcasters typically gear up a little differently than inland shore anglers as the conditions tend to be more severe, featuring high winds and heavy surf. In addition to rod, reel, and tackle, the surfcaster’s typical equipment list should include items for safety and for comfort such as waders secured by a tight wader belt to prevent filling with water, dry top, line clippers, pliers, hook cutters, and knife as well as a neck light or headlight for use at night. Additional items for safety may include steel-studded soles attached to the wader boots to improve traction, and an inflatable life vest to prevent drowning accidents in more severe conditions, as several surfcasting fatalities occur annually. More extreme surfcasting may entail climbing on rocks far from shore to gain an advantaged position or in some cases; anglers may don wetsuits to swim to rocks in water unreachable by wading. Surfcasting gear usually includes spinning or conventional reels on rods in the 2.4-3.6 m (8-12 foot) range using lines of 7-9 kg (15-30 lb) test monofilament or equivalent diameters of braid. Some surf-fisherman don't like to use braids because it will cut easily on rocks but recent advancements in braid are making it more acceptable in the fishing community. High vis line is best in blitz situations when it is important to see your line. Plastic lures such as bombers, redfins, yozuris all work. When choosing a lure, the profile of the fish you are trying to mimic and the movements of the lure are more important than the color—striped bass do not have the same rods and cones as a human eye. Other lure choices are wooden lures, lead jigs, and soft plastics. Live bait is very effective such as herring and eels. Cut bait like chunks of herring and mackerel work well when live bait can't be fished. In the Atlantic, Striped Bass heavily pursue schools of Atlantic menhaden or more commonly known as Mossbunker. When cut up into chunks, this can be one of the most effective baits. Some other important bait choices include clams, worms, and crabs. Often a sand spike is used when fishing the surf to hold a rod fished with bait. A lead weight can be used to keep the bait to the ocean floor. Trolling for bass is excellent sport, and is practiced a good deal by amateurs. The tackle employed is a strong hand line, and artificial bait is used with good success. This consists of silver plated spoons, bucktales with plastic trailers, and surgical tubes (representing eels). Squid and eel are also an excellent bait for trolling. In order to fasten a squid to a hook, the squid's "spine" should be pulled out and the line threaded through the 'hoods' cavity with a needle. Freshwater stripers can be caught using alewives and other shads, threadfins, crayfish, and trout. The striped bass will readily eat anything that moves, including smaller individuals of its own species. It is a temperature-specific fish, with an optimal water temperature of 17°C (63°F). In searching for prime striper fishing grounds, focus on optimal water temperature rather than the structure of the environment. The bigger fish are more affected by water temperature than the smaller ones. The bigger fish are often large and lazy, and can be caught on cutbait since they sometimes wait for scraps missed by the smaller, faster fish, instead of using their energy to chase down their meals. Another good way to catch rockfish while trolling is try to use a 20-30 cm (8-12 in) white worm with a twirl tail depending on the size of rockfish you are going for the big bass. Striped bass go up to the river for spawning. Construction of dams, water pollution, and other consequences of the industrial developments affect the striped bass as well as other species. In some areas, fishway was constructed to allow fish to go through the dam. Discharge of toxic industrial wastes, however, have lasting effects. General Electric, for example, dumped about 1.3 million pounds of PCB, with governmental approval, in the upper Hudson River in New York from 1947 to 1977. Contamination of fish became evident which resulted in the closure of the commercial striped bass fishery on the Hudson. Residents were also warned about health risk for eating fish from the Hudson river. Over the dredging the massive amount of disposed PCB, local communities, government agencies, and General Electric had a fierce battle both inside and outside of the court. While GE made a media campaign of not dredging, local villages and towns made a series of resolutions of demanding the clean up. The final settlement was made to clean up PCB from river bed and the project is under way. New York Department of Health has been issuing a warning to recreational fishermen for health risk for eating any fish from the Hudson River. ↑ Mary Jane Williamson, Angling Retains its Mainstream Appeal and Broad Economic Impact, American Sportfishing Association. Retrieved July 30, 2008. ↑ Karl Blankenship, Fishway construction starts at Little Falls Dam on Potomac, Bay Journal. Retrieved July 30, 2008. ↑ Charles F. Waterman, Black Bass & the Fly Rod (Stackpole Books, 1993). ↑ Arizona Game and Fish Department, Largemouth Bass. Retrieved July 30, 2008. ↑ James Henshall, Book of the Black Bass (1881). ↑ Will Ryan, Smallmouth Strategies for the Fly Rod (Lyons & Burford Publishers, 1996). ↑ ORCA Online, Reel History. Retrieved July 30, 2008. ↑ Harry Murray, Fly Fishing for Smallmouth Bass (Lyons Press, 1989). ↑ Lefty Kreh, Fly Fishing for Bass (Lyons Press, 2004). ↑ ICUN, Global Invasive Species Database. Retrieved July 30, 2008. ↑ New Jersey Division of Fish and Wildlife. ↑ Department of Health and Human Services, Health Consultation, Hudson River PCBS, Glen Falls, Warren County, New York, Agency for Toxic Substances & Disease Registry. Retrieved July 31, 2008. ↑ U.S. Environmental Protection Agnecy, EPA Reports Show PCBs From Upper Hudson River May Affect Human Health in Mid-Hudson; Threaten Fish and Wildlife in Lower Hudson for Decades. Retrieved July 31, 2008. ↑ U.S. Environmental Protection Agency, Health Advisory on Eating Fish Caught in the Hudson River, Hudson River PCBs. Retrieved July 31, 2008. Bauer, Edwin A. (1955). Bass In America-The Haunts, habits and other secrets of one of the worlds' finest freshwater game fish. New York: Simon and Schuster. Bergman, Ray (1942). Fresh-water Bass. New York: Willam Penn Publishing Co..
Brooks, Joe (1947). Bass Bug Fishing. South Brunswick, NJ: A. S. Barnes. Clouser, Bob (2007). Fly-Fishing For Smallmouth in Rivers and Streams. Mechanicsburg, PA: Stackpole Books. ISBN 0811701735. Dalrymple, Byron (1972). Modern Book of the Black Bass. New York: Winchester Press. ISBN 0876910665. Gasque, Jim (1945). Bass Fishing-Technique, Tackle and Tails. New York: Alfred A. Knopf. Harris, William C. and Rhead, Louis (ed) (1905). The Basses Fresh-Water and Marine. New York: Frederick A. Stokes and Company. Hawes, Harry B. (1930). My Friend The Black Bass. New York: Frederick A. Stokes and Company. Henshall, James A. MD (1881). Book of the Black Bass-Angling and Fly Fishing. Cincinnati: Robert Clark & Co..
Hollis, Harold C. (1945). Bass Tackle and Tactics—Better Sport Through The Use of Lighter Tackle. New York: A. S. Barnes and Company Inc..
Jones, Sheridan R. (1927). Black Bass & Bass Craft—The life habits of the two bass and successful angling strategy. New York: The MacMillian Company. Kesting, Ted (1962). Bass Fishing - Sports Afield Library. New York: Thomas Nelson & Sons. Knight, John Alden (1949). Black Bass. New York: G. P. Putnam and Sons. Kreh, Lefty (2004). Fly Fishing For Bass. Lyons Press. ISBN 9781592283101. Lincoln, Robert Page (1952). Black Bass Fishing-Theory and Practice. Harrisburg, PA: The Stackpole Company. Livingston, A.D. (1974). Fishing for Bass—Modern Tactics and Tackle. Philadelphia: J. B. Lippincott Company. ISBN 0397010176. Livingston, A.D. (1976). Fly-rodding for Bass. Philadelphia: J. B. Lippincott Company. ISBN 0397011121. Livingston, A.D. (1977). Tying Bugs and Flies for Bass. Philadelphia: J. B. Lippincott Company. ISBN 0397011873. Murray, Harry (1989). Fly Fishing For Smallmouth Bass. New York: Lyons and Burford Publishers. ISBN 0941130851. Ovington, Ray (1983). Tactics on Bass—How to Wade, Cast, and Fish Out Each of 23 Different Kinds of Bass Areas. New York: Charles Scribner's & Sons. ISBN 0684178605. Ripley, Ozark (1924). Bass and Bass Fishing. Cincinnati: Sportsman Digest Publishing Co..
Ryan, Will (1996). Smallmouth Strategies for the Fly Rod. New York: Lyons & Burford Publishers. Waterman, Charles F. (1993). Black Bass and the Fly Rod. Mechanicsburg, PA: Stackpole Books. ISBN 0811716309. Westmorland, Billy (1976). Them Ol' Brown Fish—Bill Westmoreland on Smallmouths. Nashville, TN: The Parthenon Press. This page was last modified on 21 December 2012, at 17:38.